From the recent concluded February 2018 Physical and Occupational Therapist Licensure Examinations, the Professional Regulation Commission (PRC) already revealed the lists of passers. 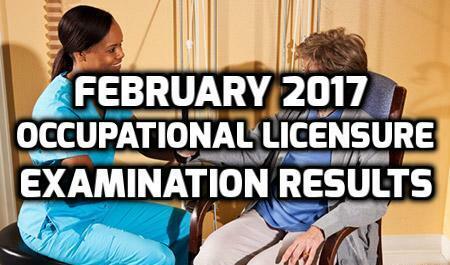 As detailed by the commission, about 1,017 applicants took the board exam for the Physical Therapist licensure and only 588 passed successfully. For the Occupational Therapy licensure, 212 applied and 129 passed the examination held last February 4-5, 2018. The examinees took the board in Cebu and Manila under the administration of the Board of Physical and Occupational Therapy, headed by its chairperson Pollyana G. Escano. The PRC was able to release the passers after two working days of the final examination day. 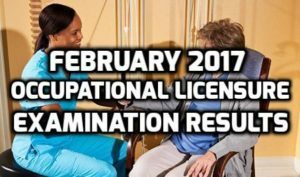 Here are the results for the recently concluded 2016 Occupational Therapists licensure examination. Congratulations to everyone who passed the examination. For the passers who will get a Professional License ID, there are requirements to be passed. Here are the requirements.